In a recent blog posting that received wide industry attention, I detailed how the Defense Advanced Research Projects Agency (DARPA) is investing big money in research and development efforts related to big data. An observation discussed in that post concerned the fact that advanced analytics and technologies like distributed computing are becoming entwined with modern, networked weapons systems. The incorporation of big data is a function not only of the growing complexity of weapons, but also of the command and control capabilities that today’s U.S. military is employing. Facing a falling number of military personnel, all branches of the Defense establishment are turning to networked and unmanned weapons commanded and controlled from a distance to offset the strain on American fighting power. In this context, DARPA’s R&D efforts are the “tip of the spear” when it comes to figuring out how big data technology can enhance combat capabilities. DARPA is not the only Defense organization, however, that is dedicating R&D dollars in this area. The military services are also investing and in general the funding flowing into those research efforts is growing annually. 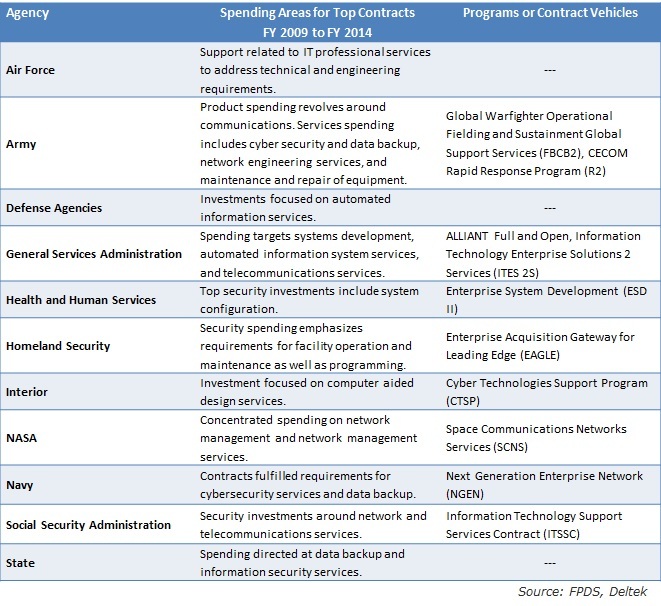 As the numbers in the chart above demonstrate, all of the military services are funding R&D efforts related to big data. 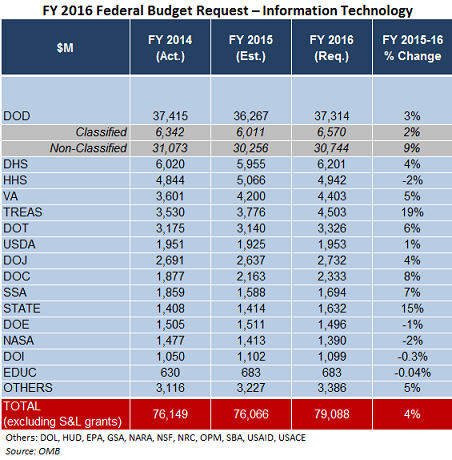 The data in the table above reflects projects in the FY 2016 Defense Research, Development, Test, and Enhancement (RDT&E) budget request that are dedicated primarily to some type of big data R&D. Put otherwise, developing a big data-related capability is the primary objective of the effort. In addition to these primary efforts, there is a plethora of other research programs that include big data technologies as part of the effort. The FY 2016 requested funding numbers for those programs with a related big data component are shown below. What to make of these figures? First, when the primary objective of a project (Table 1) is developing a big data solution, the Navy is leading the way among the military services. A big reason for this is the Navy’s push to employ unmanned systems – aerial, surface, and undersea – on a much greater scale than at present. The development of these systems requires an incredible amount of money, with work focused on enhanced C2 capabilities, cyber security, and analytics for parsing intel data gathered by these systems. This trend is in evidence in the Air Force and Army as well, just not to the extent it is in the Navy, so if your company works in this area, it is a green field. Second, from FY 2015 to FY 2016, the Army intends to nearly double its investment in primary big data related R&D (Table 1), reflecting a focus on parsing intel data and on utilizing big data for cyber security operations, especially automated network monitoring and defensive response. Third, the Air Force is the only service that will see investment in primary big data R&D fall in FY 2016. This is due to some slight cuts in multi-source fusion technologies research and in the evaluation of advanced countermeasure concepts. When it comes to big data R&D related to other efforts (Table 2), the total planned investment grows significantly, with a special focus on the automation of complex networks, analysis and use of sensor fusion technology, and exploitation of intel data. In conclusion, looking at this one piece of the DoD big data market we can see that the military services intend to spend at least $159 million in FY 2016 on R&D related primarily to a big data objective. At most, they intend to spend almost $725 million, if we count programs with a related big data component. Keep in mind that these numbers do not include present investments in operations and maintenance and procurement programs. Big data R&D is thus a growing area of Defense IT spending in an otherwise flat market. Half-way Through FY 2015, How Much Are Agencies Spending on Contracts? It’s April, and that means we are half way through fiscal year (FY) 2015. So I thought I would take a look at the available federal contracting data to see what can we tell so far about how much federal departments have spent on contracts at the mid-point in the year and see what might be in store for us in the second half of FY 2015. For comparison and context I looked the federal contract obligations reported for each federal agency for FY 2014, quarter by quarter, and then the first two fiscal quarters of FY 2015, which just closed at the end of March. Then, to get what I thought would be a conservative approach to estimating what spending might look like for the remainder of FY 2015 I took 90% of each agency’s total FY 2014 contract spending and subtracted out what agencies have already reported for actual Q1 and Q2 contract spending. In other words, my assumption is that agencies would spend at least 90% of what they did last year. Finally, based on this 90% spending assumption I calculated each agency’s FY 2015 Q1 and Q2 relative percentages of total (90%) estimated obligations. In FY 2015, these top twenty have reported $89.3B and $34.1B for Q1 and Q2 respectively, although DoD lags in their financial reporting by up to 90 days so Q2 is understated. Still, if these top agencies spend 90% of what they did in all of FY 2014 they will have more than $270B left to obligate in the remaining two quarters of this fiscal year. A handful of departments have Q1 FY 2015 obligations lower than they did in Q1 of FY 2014 (DoD, USAF, State, DoT, Ed, and Labor). Most have marginally higher obligations year-over-year, although Navy reported over $6B (+40%) more in obligations in Q1 in FY 2015 than last year. More departments appear to be lagging in Q2 FY 2015 compared to Q2 of last year and some of these are fairly large relative proportions. For example, HHS shows a $1B (-24%) decrease in Q2. Similarly, VA has reported a $1.1B (-30%) decrease. Finally, State, GSA, and DOT each have reported about a 50% drop in Q2 FY 2015 obligations from Q2 FY 2014. Of course, given the DoD’s three-month reporting delay we will not know the contracting rates among those departments until this summer. Taken together, the four defense branches in Q1 FY 2015 have reported $3B more in obligations than they reported in Q1 of FY 2014, although the DoD and Air Force have reported lower levels year-over-year. This kind of macro-level analysis is useful in getting a general sense of quarterly and yearly patterns across the departments. Of course, the remaining FY 2015 obligation estimation depends on its main 90% assumption. Last year, this approach pointed to roughly $285B in combined FY 2014 Q3 and Q4 obligations among the top twenty departments. A year later, the final FY 2014 Q3 and Q4 data shows that actual obligations came in at $246.4B, so at first glance it appears that my 90% assumption was a bit optimistic. However, the difference turns out to be a matter of timing rather than magnitude. The final FY 2014 Q1 and Q2 obligations given above come in at $69B higher than what agencies reported at this time last year, reflecting revisions due to lagging obligation data being added later in the year. So the numbers effectively washed out once the dust settled. Unfortunately, there is no reliable way of predicting how consistently agencies will report their contract spending from year to year. As most federal business development people will attest, understanding your agency’s spending patterns goes a long way to being able to successfully work with them to get contracts awarded as well as develop your yearly business plan. In Februrary, the White House released its fiscal year (FY) 2016 budget request, including agency discretionary and information technology (IT) budget submissions. However, as is often the case in recent years, we had to wait until March before we got full detail on the DoD and component IT budget numbers, like the Navy. Not that the data is released, what do the numbers tell us? The FY 2016 federal budget provides the Navy with $161B in base discretionary funding, an increase of $11.8B (+7.9%) from the FY 2015 enacted level, coming in second behind the Air Force in base budget increases. The budget also includes $7B in total Overseas Contingency Operations (OCO) funding, a reduction of $2.6B (-27%) from FY 2015, which is second in cuts behind the Army. $44.3B in in base funding for Procurement, up $3.4B (8%) from FY 2015 enacted level of $40.9. $50B in base funding for Operations and Maintenance (O&M), an increase of $4.7B (+10.5%) from the FY 2015 enacted level of $45.3B. $17.9B in base funding for Research, Development, Test, & Evaluation (RDT&E), up $2.1B (+13%) from the FY 2015 enacted level of $15.8B. Delving further into the Navy’s IT budget investments and initiatives provides some vision into their current priorities and future direction. Here are a few initiatives that stand out among others due to relative size, budget growth, and/or proportion of new development spending. Next Generation Enterprise Network (NGEN) – Provides secure net-centric data and services to Navy/Marine personnel. At $1.4B this is the largest single Navy IT investments for FY 2016 and receives a 3.6% increase from FY 2015 and has 0.2% DME funding. Base Communications Office (BCO) – Supports voice and data communications and video teleconferencing (VTC), etc. BCO receives a 26.5% budget increase to $222M in FY 2016, of which 0.5% is DME. Multifunctional Information Distribution System – A rapid communications, navigation and identification system for tactical and C2 operations, this investment receives $107M (+12.9%) for FY 2016, of which nearly 75% is DME. Core Services Architecture (CSA) – Provides the Hosting Shell of all network, server, and storage hardware and provides a management environment for production development and test systems. At $93M (+10.6%) for FY 2016, this investment is 100% O&M funding. Joint Precision Approach and Landing System – A GPS based, rapidly deployable approach and landing capability, this $91M investment receives a 18.4% increase for FY 2016 and is 100% DME funding. After experiencing both a the total discretionary and IT budget reduction from FY 2014 to FY 2015, The Navy’s discretionary and IT budgets for FY 2016 have rebounded to near FY 2014 levels. Yet, the ongoing shift in Navy IT to predominantly O&M spending continues to point to an agency that is economizing and scrutinizing new IT investments, which could challenge companies looking to introduce new technologies or win new business. The Defense Information Systems Agency (DISA) is playing an increasingly important role in Defense IT, a role that is expected to grow with maturation of the Joint Information Environment (JIE). Funding for DISA’s programs garners a lot of attention, therefore, as vendors seek to understand where contract dollars in the agency’s IT budget may be going and which Defense organizations are buying DISA’s services. Today’s post takes a look at the broad outlines of DISA’s proposed budget for the upcoming fiscal year and breaks down some salient points vendors need to know. 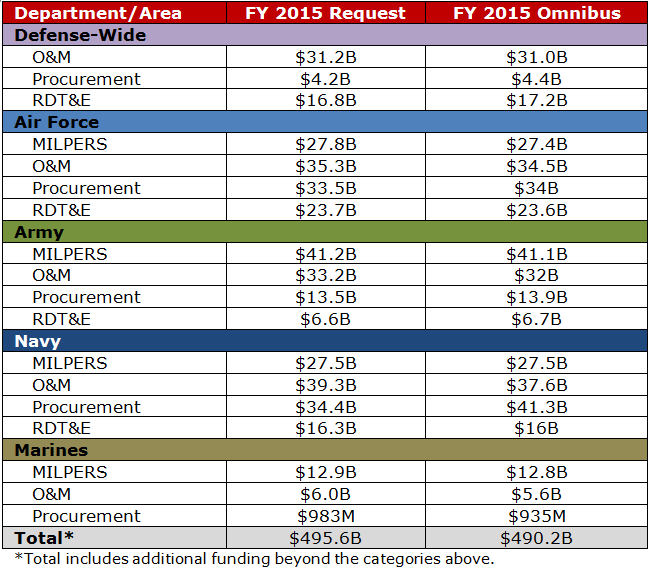 Where does DISA’s IT budget fit into the broader Department of Defense IT budget request for FY 2016? The chart below shows the Defense-Wide IT budget for fiscal years 2014 through 2016 alongside DISA’s IT budget for those same years. As a reminder, the big drop in DISA’s FY 2015 IT budget was caused by a change in the way the DoD CIO calculates the Defense Working Capital Fund. For FY 2015, funding is now identified in the ‘senders’ accounts (i.e., Defense customers) rather than the investment owner's (i.e., DISA’s) account. The FY 2015 calculation change aside, DISA’s proposed IT budget for FY 2016 shows a continuing decline despite the fact that most of the DoD is relying more on the agency for its services. Overall, DISA’s IT budget is expected to decline from an estimated $3.19B in FY 2015 to $3B in FY 2016, a drop of $190M, or just under 6%. Moving to the specific services that DISA provides, the chart below shows the orders for DISA’s computing services that Defense customers have placed (or are expected to place, as the case may be) from FY 2014 to FY 2016. The computing services DISA supplies include Core Data Center services, DoD Enterprise Email, DoD Enterprise Portal Service, GIG Content Delivery Service, and the agency’s milCloud infrastructure service. The data for these services reveals a few interesting trends. First, both the Army and Air Force continue to use DISA-provided computing services more than the Navy. DISA, however, expects orders from Air Force customers to drop in FY 2016, while those from Army customers will grow. The implications of this are clear for Defense contractors – in FY 2016 the Army will spend less money on contracted efforts for computing services outside of DISA. Conversely, the Air Force may be a better place to search for specific opportunities in this area. Second, Defense-Wide appropriations are expected to nearly double, suggesting that the Defense Agencies are continuing to embrace the enterprise services provided by DISA under the JIE concept. Third, Navy new orders are expected to decline slightly, from $44M in FY 2015 to $42M in 2016. The Navy’s ongoing flat/declining use of DISA services continues to suggest the service will spend its computing services contract dollars with its big CANES and NGEN prime contractors. The Marine Corps’ new orders are expected to grow slightly, up from $28M in FY 2015 to $33M in FY 2016. Turning now to transport and enterprise acquisition services, which DISA reports in combination, the new order trends are similar to those in computing services. Nearly all parts of DoD are expected to spend more with DISA in FY 2016 than they did in FY 2015. Only the Navy ($571M in FY 2015 dropping to $569M in FY 2016) and Marines ($111M in FY 2015 dropping to $110M in FY 2016) show declines. Dropping Navy/USMC spending is consistent with statements by officials from both services that they will continue to rely more heavily on their own networks rather than DISA’s for transport and communications services. In conclusion, in FY 2016 DISA will continue to play the central role in the DoD’s new Joint Information Environment, with spending on its services by the MILDEPS dependent on the level of each department’s involvement in standing up the JIE. Spending by the Army, Air Force, and Defense Agencies will continue to be the strongest, while spending by the Navy and Marine Corps continues to lag. Information Technology (IT) budgets are UP for fiscal year (FY) 2016 nearly across the board for major federal departments. The Obama Administration released its FY 2016 Budget request Monday morning, and around 6 p.m. the Office of Management and Budget (OMB) posted details on the Information Technology budget proposal, revealing a return to year-over-year budget increases for both the Defense and Civilian top-line numbers and net increases for most Executive Branch departments and agencies. In a previous entry we looked at the overall FY 2016 discretionary budget highlights across the top agencies. Here, we will focus on IT. In addition to the many budget increases for the next fiscal year, many agencies are also allocating greater funds to Development, Modernization, Enhancement (DME) efforts over Operations and Maintenance (O&M). These and other funding observations are included in the following agency highlights. The DoD is allocated a total of $37.3B in IT funds for FY 2016, a 3% increase over the FY 2015 enacted level of $36.3B. The total funds are split between classified and non-classified areas, $6.6B and $30.7B respectively. If enacted, this would mean a 2% increase in classified DOD IT and a 9% increase in non-classified DOD IT. OMB released only top-line IT budget numbers for DoD and promised detailed updates in early March. This is fairly common practice each budget cycle, but shrouds DoD IT spending longer than any other department. Until then, we pursued what IT-related spending information could be gleaned from other DoD budget documentation. $2.6B in Space Procurement funding, which budget materials note that FY 2016 marks the first year that such procurement are broken out. $31.4M in Procurement funds for “General Information Technology,” down from $43M in FY 2015. The USDA’s FY 2016 budget request for IT is $1.95B, 1.56% higher than the estimated level of $1.92B in Fiscal Year 2015. The president’s budget request provides $2333.2M in funding for the Commerce Department’s information technology, an 8% increase over FY 2015 enacted levels. 62% of FY 2016 funds are dedicated to operations and maintenance, a 3% increase over the FY 2015 enacted levels. Funding to support development, modernization, and enhancement efforts totals over $880M for FY 2016, rising above the amount enacted in FY 2015 by 38%. The top ten investments by requested funding for FY 2016 combine to make up just over 57% of Commerce’s entire IT budget. Includes $339.7M in new investments for FY 2016. Funding for upgrades is set to receive $5.2M for FY 2016, level with the enacted amounts for FY 2015. Mission delivery and management support efforts request an additional $84M, bringing the total for FY 2016 to $1,415.5M and marking a 9% increase over the enacted level from FY 2015. Commerce aims to provide $798.3M in funding for infrastructure, office automation, and telecommunications, an increase of 8% over levels from FY 2015. Increasing 27% over the enacted level for FY 2015, Commerce has identified $116.2M for efforts related to enterprise architecture, capital planning, and CIO functions. The president’s budget request provides $1,469.1M in funding for the Energy Department’s information technology, a 1% drop from FY 2015 enacted levels. 92% of FY 2016 funds are dedicated to operations and maintenance, a 1% increase over the FY 2015 enacted levels. Funding to support development, modernization, and enhancement efforts decline below the amount enacted in FY 2015 by $25.M, marking a drop of 18%. With details for over 700 investments for FY 2016, the top ten investments by requested funding combine to make up around 11% of Energy’s IT budget. Includes $72.7M in new investments for FY 2016. Consolidation activities are set to receive $43.6M. Funding for upgrades is set to receive $3.5M for FY 2016, level with the enacted amounts for FY 2015. Energy is targeting $663.8M in funds for mission delivery and management support, marking a drop of 2% from FY 2015. Maintaining the enacted funding level from FY 2015, Energy aims to provide $747.6M for infrastructure, office automation, and telecommunications. Increasing 7% over the level for FY 2015, Energy is looking to provide $73.5M for efforts related to enterprise architecture, capital planning, and CIO functions. The president’s budget request provides $11.4B in total IT funding to HHS, a 10% decrease over FY 2015 enacted levels. Grants account for $6.4B of the total IT budget. HHS’ proposed IT budget without grants totals $4.9B which is a 2% decrease over FY 2015. The budget request provides $6.2B for IT investments at DHS for FY 2016, a 4% increase over the FY 2015 enacted level of $5.9B. The president’s budget request provides $1,098.5M in funding for the Department of the Interior’s information technology, a drop of less than one percent from FY 2015 enacted levels. 92% of FY 2016 funds provide operations and maintenance, a 2% increase over the FY 2015 enacted levels to $1014.2M. At less than $85M for FY 2016, support for development, modernization, and enhancement efforts drops 20% below the amount enacted in FY 2015. The top five investments by requested funding for FY 2016 combine to make up over 61% of Interior’s entire IT budget. New investments receive $5.6M for FY 2016. Requesting $402.1M for mission delivery and management support efforts, Interior looks to slightly raise the funding for these investments bumping the total up by 1% over the FY 2015 levels. Interior’s request of $657.6M for investments targeting infrastructure, office automation, and telecommunications marks a 1% decrease from FY 2015 enacted levels. Dropping 13% from the level enacted for FY 2015, Interior has identified $38.3M for investments related to enterprise architecture, capital planning, and CIO functions. The president’s budget request provides $1,390.4M in funding for NASA’s information technology, a 2% decrease from FY 2015 enacted levels. 95% of FY 2016 funds are dedicated to operations and maintenance, maintaining the FY 2015 enacted levels at $1,323.1M. Funding to support development, modernization, and enhancement efforts takes a hit for FY 2016, dropping 27% below the amount enacted in FY 2015 to $67.3M. The top five investments by requested funding for FY 2016 combine to make up nearly 59% of NASA’s entire IT budget. NASA is looking to maintain its spending for mission delivery and management support, requesting $942.8M for FY2016. $445.2M for Infrastructure, office automation, and telecommunications, a 2% drop from FY 2015 levels. Maintaining the funding level enacted for FY 2015, FY 2016 would see $2.5M for efforts related to enterprise architecture, capital planning, and CIO functions. The president’s budget request provides $2732.3M in funding for the Justice Department’s information technology, a 4% increase over FY 2015 enacted levels. Topping $2,250M for FY 2016, 83% of these funds are dedicated to operations and maintenance, marking a 5% increase over the FY 2015 enacted levels. At $476.1M for FY 2016, funding to support development, modernization, and enhancement efforts stay fairly level with the amount enacted in FY 2015, dropping by only 1%. The top ten investments by requested funding for FY 2016 combine to make up nearly 37% of Justice’s entire IT budget. Includes $110.6M in new investments for FY 2016. $478.6M is requested for system upgrades, an increase of around $5.5M over enacted levels for FY 2015. Consolidation activities are set to receive $237.3M. Dropping by 2% from the enacted FY 2015 levels, the request for mission delivery and management support activities totals $1,138.0M for FY 2016. Justice aims to provide $1,413.8M in FY 2016 for infrastructure, office automation, and telecommunications, marking an increase of 10% from the level enacted for FY 2015. Rising 23% above the FY 2015 level, Justice has identified $152.2M for efforts related to enterprise architecture, capital planning, and CIO functions. SSA sees a 7% budget increase for FY 2016, growing to $1.7B from $1.6B in FY 2015. The State department receives $1.6B in IT funds for FY 2016, up 15% with an increase of $218M from FY 2015. The DOT’s FY 2016 budget request for IT is $3.3B, 6.4% higher than the estimated level of $3.1B in Fiscal Year 2015. The president’s budget request provides $4.5B in total IT funding to Treasury, a 19% increase over FY 2015 enacted levels. The president’s budget request provides $4.4B in total IT funding to VA, a 5% increase over FY 2015 enacted levels. We will be publishing our complete analysis of the FY 2016 budget request – including IT investments and initiatives – in the weeks to come. Fellow GovWin Federal Industry Analysis (FIA) analysts Kyra Fussell, Deniece Peterson, Angela Petty and Alex Rossino contributed to this entry. The White House released its FY 2016 Budget request today, perhaps the earliest annual budget release of the Obama Administration thus far. Several of my fellow GovWin Federal Industry Analysis (FIA) colleagues and I wasted no time in delving into this budget so that we could provide you with our first impressions of what we found noteworthy. Similar to each presidential budget, the FY 2016 President’s Budget Request provides a blueprint for the administration’s policy and legislative agenda for the coming fiscal year and beyond. We reviewed the largest federal departments’ discretionary budgets to get a sense of direction and priorities for FY 2016, which begins October 1, 2015. Below is a summary table followed by key funding details and initiatives arranged by department. 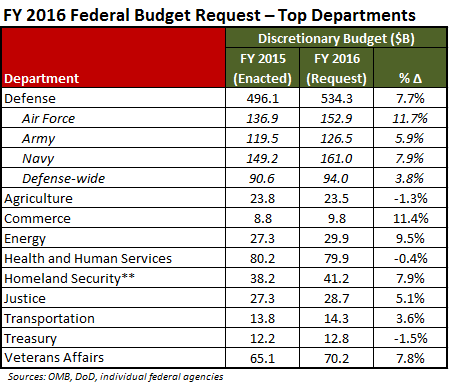 DoD’s discretionary base budget request is up nearly 8% over FY 2015. The $534.3B in discretionary funding is $38.2B more than the FY 2015 enacted level. The president’s budget request includes $23.5B in discretionary appropriations for the Department of Agriculture, 1.25% below the enacted level of $23.8B in Fiscal Year 2015. The president’s budget request provides $9.8B in base discretionary funding to Commerce, an 11% increase over FY 2015 enacted levels. These funds are intended to promote growth through trade, invest, and innovation as well as a data-driven economy. Provides funding to National Institute of Standards and Technology in support of advance in areas like cybersecurity and advanced manufacturing. Efforts to work with industry are called out in particular, such as implementing the Cybersecurity Framework of standards and best practices. Funding will also sustain work on initiatives like cybersecurity automation and the National Strategy for Trusted Identities in Cyberspace (NSTIC). $1.5B to Census to support research, development, and implementation of the 2020 Census. The Census Bureau will also include planned increase for the Economic Census and advance initiatives to make data and resources publicly accessible. Continues strong funding for National Oceanic and Atmospheric Administration, including $2B for next generation weather satellites, including $380M for the Polar Follow-On satellites. $147M in funding is also provided for the construction of an ocean survey vessel. $1.1B for National Weather Service includes increases in funding for critical infrastructure. Includes $3M to establish an in-house Idea Lab to pursue innovative approaches to achieve the agency’s strategic goals and objectives. Requests $6M to build a digital services team for Department of Commerce dedicated to improving IT systems and services. $497M for the International Trade Administration includes $20M to expand SelectUSA efforts to grow business investment in the United States. Auctions 500MHz of federal spectrum, aiming to reduce the deficit by $40B over the next decade and provide greater commercial access to spectrum. The president’s budget request provides $29.9B in base discretionary funding to Energy, a 10% increase over FY 2015 enacted levels. These funds are intended to support nuclear security, clean energy, environmental cleanup, climate change response, as well as science and innovation. $5B in funding supports transformational research and development for critical technology areas such as nuclear safety, grid modernization, solar and renewable energy, and energy efficiency. $5.3B to support scientific research, especially in the physical sciences. $12.6B for National Nuclear Security Administration, an 11% increase over FY 2015 enacted levels. $5.8B for critical nuclear legacy cleanup responsibilities. Expands efficiency initiatives introduced in FY 2015 to advance key priorities and improve project integration. The president’s budget request provides $79.9B in base discretionary budget authority to HHS, a 0.3% decrease over FY 2015 enacted levels. Supports the Affordable Care Act and operation of the Health Insurance Marketplace. Provides $4.2B to serve 28.6 million patients at more than 9,000 health center sites in medically underserved communities. $2.7B of this amount is new mandatory funding. Funds reform of health care delivery by finding better ways to deliver care, pay providers, and distribute information. Promotes innovative medical research to maintain the nation’s leadership in the life sciences including research into Alzheimer’s disease. Advances product development efforts to support procurement of next-generation medical countermeasures against chemical, biological, radiological, and nuclear threats with a $522M investment. Accelerates progress in scientific and public health efforts to detect, prevent, and control illness and death related to antibiotic-resistant infections with funding of $993M. Proposes targeted reforms to Medicare and Medicaid which are projected to save more than $400B over the next decade. Provides the Indian Health Service with $5.1B, an increase of $461M over FY 2015 enacted levels, to expand health care services and construct clinics and sanitation facilities. Includes $1.6B to bolster food safety activities. Promotes continued efforts to cut waste, fraud and abuse in Medicare and Medicaid including removing social security numbers from Medicare beneficiary ID cards. DHS would receive $41.2B in base discretionary funding in the president’s budget request, a 7.9% increase over the FY 2015 $38.2B budget request level. DHS is currently operating under continuing resolution (CR) at the FY 2014 enacted budget level of $39.8B. This CR expires on 2/27 by which time Congress is expected to pass appropriations to cover the remainder of FY 2015. $3.7B for Aviation Security and Screening at the Transportation Security Administration (TSA) sustain aviation security and effectively align passenger screening resources based on risk. These risk-based security initiatives maximize security capabilities and expedite the screening process for low-risk travelers. $132.3M for the Customs and Border Protection (CBP) Trusted Traveler Programs (TTP) to provide expedited travel for pre-approved, low-risk travelers through dedicated lanes and kiosks. $101M for Radiological and Nuclear Detection Equipment for detecting and interdicting illicit radioactive or nuclear materials by the Domestic Nuclear Detection Office and other DHS components. The president’s budget request provides $28.7B in base discretionary funding to Justice, a 5% increase over FY 2015 enacted levels. These funds are intended to support core law enforcement needs, safe and secure prisons, and other Federal, State, Tribal and local programs. Strengthening investment in cybersecurity through over $200M in IT upgrades and tools to detect and deter cyber-attacks. Funds also support plans for a Federal Cyber Campus to co-locate critical civilian cybersecurity agencies. Provides $97M to expand training and oversight for local law enforcement, increase the use of body worn cameras, and provide additional opportunities for reform through technical assistance and training. $482M in funds to address the back log of immigration cases at the Executive Office of Immigration Review. These funds will support hiring judges and legal representation as well as expanding the Legal Orientation Program. Efforts to combat violent extremism include $4M for research, $6M for model development, $2M for technical assistance, and $3M for projects to enhance collaboration between law enforcement, communities, and other stakeholders. Credits applied to Justice’s discretionary budget authority for FY 2016 include $13.5B from the Crime Victims Fund (CVF) and $304M from the Assets Forfeiture Fund (AFF). Both of these figures are up from the FY 2015 enacted levels. The CVF is up 39% over FY 2015, while AFF is up 58% for the same period. The president’s budget request includes $14.3B in discretionary appropriations for the Department of Transportation, 3.5% less than the $13.8B enacted in Fiscal Year 2015. The president’s budget request provides $12.8B in base discretionary budget authority to Treasury, a 4.9% increase over FY 2015 enacted levels. Includes $2.9B for Treasury’s international assistance programs to promote economic growth, poverty reduction, action on climate change, and security through Multilateral Development Bank (MDB) investments in developing and emerging economies. Funds increases in transparency and accountability in federal financial management and implements the Digital Transparency Act of 2014 (DATA Act). Proposes funding to transform Treasury’s digital services with the greatest impact to taxpayers and businesses so they are easier to use and more cost-effective to build and maintain. Provides IRS with $12.3B in base discretionary resources, an increase of $1.3B from FY 2015, to restore taxpayer services to acceptable levels. Funds are also provided to continue major IT projects, which aim to protect taxpayer information, modernize antiquated systems, continue development of a state-of-the-art online taxpayer experience. The president’s budget request provides $70.2B in base discretionary budget authority to VA, a 7.8% increase over FY 2015 enacted levels. VA also received $15B in the Veteran Access, Choice, and Accountability Act of 2014. Continues the largest department-wide transformation in VA’s history through MyVA, an effort to reorient the department around the needs of veterans. Improves veterans’ access to medical care by investing $60B. Supports improvements in veterans’ mental health care, telehealth care, life-saving treatment for Hepatitis C, specialized care for women veterans, long-term care, and benefits for veterans’ caregivers. Provides $1.4B for programs aimed at ending veteran homelessness in 2015. Strengthens veterans benefit programs by proposing an increase of $85M to hire 770 new staff to improve timeliness of non-rating claims, reduce the inventory of veterans’ appeals, strengthen the fiduciary program and further enhance disability claims processing accuracy and efficiency through centralized mail and the national work queue. As of publishing time, the Office of Management and Budget (OMB) had not yet published IT budget specifics, but topline numbers show a 2.5% increase for FY 2016. This puts the total IT request (including state and local grants and classified defense spending) at $86.4 billion compared to the FY 2015 estimate of $83.4B. $450 million to drive forward progress on cross-agency management priorities such as the U.S. Digital Service (USDS), PortfolioStat, Freeze the Footprint, and Open Data. Providing funding to 25 agencies for the development of their own agency digital services teams. Piloting new initiatives in IT acquisition that will increase digital acquisition capability within agencies, train agency personnel in digital IT acquisitions, and test innovative contracting models. Proposing legislation making it easier for vendors to bid on modestly-sized procurements and bringing more new companies into the Federal marketplace. broadening the range of purchases that can be accomplished with minimal complexity and Government-unique requirements by requesting authority to raise the simplified acquisition threshold from $150,000 to $500,000. Stay tuned to FIA as we will be publishing our complete analysis of the FY 2016 budget request in the coming weeks, where we will go into greater detail on the key initiatives, IT investments and contractor implications that will shape the federal IT marketplace for FY 2016. The “Internet of Things” (IoT) is a pretty common phrase these days, with the rapid-expanding interconnectivity of devices and sensors sending information across communications networks, all to achieve greater capabilities, effectiveness, efficiency, and flexibility. The Department of Defense (DoD) clearly links the growth of emerging, interconnected technologies to the sustained superiority of U.S. defense capabilities, on and off the battlefield, so you could say that the IoT impacts defense IT at all levels. Information – Data from devices and sensors, (e.g. phone, camera, appliance, vehicle, GPS, etc.) and information from applications and systems, (e.g. social media, eCommerce, industrial systems, etc.) provide the content input. Connectivity – Network connections via various wireless capabilities and communications backbones provide the transport links for aggregation and distribution. This facilitates the environment where data meets the power to use that data. The use of integrated networks to connect data with processing capacity to affect outcomes is far from a new idea at the DoD – it gave us much of the warfighting capabilities we have today. But technological evolution has resulted in a growing IoT mentality that goes beyond combat operations. One example is the establishment of the Air Force Installation Service Management Command (AFISMC) to coordinate management and maintenance of resources across Air Force bases and facilities. According to Air Force CTO Frank Konieczny, potential uses of IoT include facilities and vehicle management, logistics and transportation, integrated security, and robotics. But pervasive connectivity is also creating security ramifications. In the wake of a network security incident last year, the Navy launched Task Force Cyber Awakening (TFCA) in an effort to protect hardware and software Navy-wide as IoT engulfs everything from weapons systems to shipboard PA systems. The drive to leverage sensor technologies and data analytics that these technologies enable is a driving force behind the DoD’s Joint Information Environment (JIE) network modernization efforts, so the pace of sensor-based innovation is tied to the success of JIE efforts. Adding potentially tens of thousands of diverse Internet-connected objects to a network that then need to be managed and secured will require proactive IT governance policies to ensure effectiveness, and some provisions in recent law apply. The FY 2015 National Defense Authorization Act (NDAA), passed just last month, requires the DoD CIO to develop processes and metrics within the next six months for measuring the operational effectiveness and efficiency of the JIE. Further, Congress is having the CIO identify a baseline architecture for the JIE and any information technology programs or other investments that support that architecture. These requirements may stem, in part, from a desire to help formalize and oversee JIE as an investment program, but the resulting baseline architecture will help pave the way to further implement greater IoT capabilities. The data from sensor-based devices will only continue to grow, but to maximize its utility the DoD will need a successful JIE to connect and carry the information. The U.S. Congress passed an omnibus funding bill for the remainder of fiscal year (FY) 2015 that includes $1.1 trillion in total in discretionary federal funds, roughly half of which goes to the Department of Defense (DoD). Federal News Radio reported that the Senate voted 56-40 late Saturday for the bill that will fund most agencies through September, the end of FY 2015. The House of Representatives had voted two days earlier on the spending measure, passing it 219-206. The final bill removes concerns over the possibility of government shutdowns for the rest of the fiscal year and address funding for each of the agencies covered under the twelve individual appropriations bills that traditionally make their way through Congress. The only exception in full-year funding is the Department of Homeland Security, which is funded by at continuing resolution (CR) levels through Feb. 27, 2015, due to congressional concerns over White House immigration plans. Future funding will be taken up by the next Congress. This omnibus provides total FY 2015 funding for DoD set at $553.9B – about 50% of the $1.1 trillion bill – including $490.2B in base budget and $63.7B for Overseas Contingency Operations (OCO). The $490.2B base budget is $3.3B more than the enacted FY 2014 base level of $486.9, but $5.4B less than the president’s FY 2015 budget request of $495.6B. The following is a high-level breakout of the funding levels provided for DoD in the Consolidated and Further Continuing Appropriations Act, 2015. Marine Corps Facilities Sustainment, Restoration, and Modernization - $631M, an addition of $57.4M over requested budget. Air Force Facilities Sustainment, Restoration, and Modernization - $1.45B (15 Req. ), $1.6B (15 Omnibus). $145M increase. The FY 2015 National Defense Authorization Act (NDAA) that was passed by both the House and Senate around the same time as the omnibus had authorized $521.3B in base discretionary spending, but Congress ultimately provided $31.1B less in actual funding in the Omnibus appropriations. See a previous entry for more information on the NDAA and its IT management and acquisitions implications. Check out our Civilian Highlights in the FY 2015 Omnibus. Fellow GovWin Federal Industry Analysis (FIA) analyst Alex Rossino contributed to this entry. Back in September, an organization at the National Defense University called the Center for Technology and National Security Policy published a research paper entitled Policy Challenges of Accelerating Technological Change: Security Policy and Strategy Implications of Parallel Scientific Revolutions. Looking past the long title, one finds an in-depth consideration of the implications of emerging technologies for U.S. national security and the DoD. Considering the CTNSP is part of the defense establishment, I believe it is worth taking a few minutes to examine what the authors say, particularly since their comments fit seamlessly with the recently announced Defense Innovation Initiative (DII). Papers like this can point to areas of investment and in a time of falling budgets, any insight is welcome. The report discusses more subjects than I can cover here, so in today’s post I’ll zero in on its comments about big data analytics. Use of big data analytics in the DoD is nothing new. In fact, based on recent contract spending data (see chart below), we can see that defense customers spent nearly $138 million on big data analytics over the five years from fiscal 2010 to fiscal 2014. Big data analytics in this context are defined as advanced analytics programs offering visualization and modeling capabilities that enable statistics-based prediction/forecasting. Think Mathematica, MATLAB, Splunk, Statistica, Tableau, etc. and you have an idea of the programs included in this data. 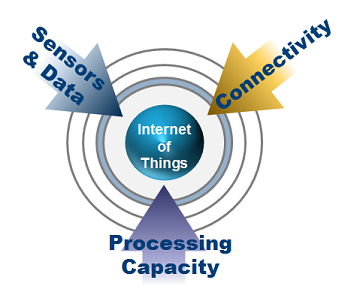 According to the CTNSP report, employing these kinds of analytics on a vastly greater scale will be the key to controlling and exploiting the data that defense organizations will be gathering from the expansion of unmanned systems, robotics, and the Internet Protocol-enabled “Internet of Things.” The uses for such analytics include the analysis of intelligence data, cyber security, and the transition to a “health maintenance-based, rather than a disease-based medical model,” that will enhance the operational readiness of U.S. military personnel. The report’s recommendations have a clear implication – that the DoD should greatly ramp up its spending on predictive analytics and the training of its personnel to use them. In recent years, however, just the opposite has been taking place. Examining the data presented above from the perspective of spending per fiscal year (see chart below), we see that defense spending on PA peaked at $42 million in FY 2012 and has declined since. Undoubtedly the recent pressure placed on DoD’s budget by sequestration is the primary reason for reduced spending on PA. The question is will this trend continue. My guess would be no, for the simple reason that the DoD cannot afford to neglect developing its PA capabilities. To do so at a time when more data is coming at defense analysts than ever before would be folly. Add the increasing use of automated systems to the mix and the answer is obvious – the DoD must spend more on PA. Currently the department is in a period of retrenchment as it struggles with new budget realities. Once this retrenchment has run its course, defense customers are likely to turn their attention back to acquiring PA capabilities. The DII points the way forward in this respect and for industry partners it’s a welcome signpost of spending ahead. Analysis of historic federal information security spending reveals where agencies are investing the most. As part of the research and analysis completed for the recent Federal Information Security Market, 2014 to 2019 report, the Federal Industry Analysis Team explored reported spending on information security across the government. Historic spending data was collected using a non-definitive selection of 24 information security related keyword searches on FPDS.gov. The resulting 224,297 contracts were culled down to 33,233 through further analysis. This analysis reviewed the initial set for IT-related product or spending (PSC) codes, duplicate entries, and as well as security related contract descriptions. The report includes findings from the over 33,000 contracts, which provide an approximate baseline total contracted value for security contract awards that can be used to assess the overall size and composition of historical federal information security spending from FY 2009 to FY 2014. The discussion in this blog addresses findings associated with the top 50 contracts from that set. The top 50 contracts spread nearly $1.4 billion in funds across 11 different federal agencies. Over the past five years, agency top contracts have provided security related products and services including compliance with security mandates (e.g. HSPD-12), encryption devices, enterprise identity management, and technology support services. While some of these awards are through stand-alone contracts or dedicated security programs, a number are associated with agency preferred contract vehicles. Going forward, agencies aiming to implement enterprise solutions or streamline costs are likely to continue leveraging existing channels to address security capabilities.